In 2006 CFC Consulting worked as a PR partner of World Music Awards, a world’s major show business award ceremony. In 2004 CFC Consulting conducted presentation of Ukraine’s investment opportunities “Doing Business in Ukraine”. In 2009 CFC Consulting presented MUPOTOON, an animated cartoons dedicated to world politics. In 2004 CFC Consulting organised a promo tour of Ruslana to Iceland in preparation to the Eurovision Song Contest. CFC Consulting’s Partner Vasyl Myroshnychenko is a board member of Ukrainian-British City Club (an organization fostering Ukraine-UK business relations) based in London. In 2005 CFC Consulting organized a speech of Ukraine’s Eurovision winner Ruslana in the European Parliament. In 2011 CFC Entertainment, the show business branch of CFC worked with the Ukrainian representative at Eurovision Mika Newton. CFC Consulting has worked as a PR partner of Monaco-based World Music Awards, a major show business award ceremony. In April 2005 CFC Consulting organized a major investment conference “Ukraine: Europe’s emerging tiger” together with PriceWaterhouseCoopers. In 2018, CFC organized one of the Davos side events at the world’s biggest annual economic summit. With our extensive experience organizing Davos events from A to Z, including not only PR but all organizational components such as design, decorations, logistics, catering, celebrity invitations, and more, CFC has been working to develop more BIG IDEAS events in Davos in the coming years. In 2004–2006 CFC Consulting facilitated the establishment of the Honorary Consulate of Tunisia in Ukraine. In 2010 CFC Entertainment, the show business branch of CFC worked with the Ukrainian representative at Eurovision Alyosha. In 2003 CFC Consulting conducted a seminar-presentation of Ukraine’s investment opportunities. Since 2002 CFC Consulting has been continuously cooperating with the Honorary Consulate of Slovenia in Kyiv. In 2008 CFC Entertainment worked with Ani Lorak, Ukraine’s representative at Eurovision Song Contest. In 2004 CFC Consulting cooperation with Ruslana brought about Ukraine’s victory at Eurovision Song Contest. Since it inception, CFC Consulting has extensively worked with a number of Moscow-based companies, international organizations and diplomatic missions. In 2007 CFC Consulting conducted presentation of Ukraine’s investment opportunities “Doing Business in Ukraine”. In 2003 CFC Consulting conducted presentation of Ukraine’s investment opportunities “Doing Business in Ukraine”. In 2005 CFC Consulting organized a concert of the famous Ukrainian chamber orchestra “Kyiv Soloists”. In 2005 CFC Consulting conducted presentation of Ukraine’s investment opportunities “Doing Business in Ukraine”. 2002 — CFC Consulting, a private LLC, was officially established as a commercial entity. The predecessor of CFC Consulting was an NGO called the Club of Five Continents founded by Gennadiy Kurochka. The goal of CFC Consulting was to provide government relations services and undertake PR projects to improve Ukraine’s international image. 2003 — At the initiative of CFC Consulting, Ukraine’s National Television Company joins the European Broadcasting Union (EBU), and receives the right to be represented at the Eurovision Song Contest (ESC). 2004 — Supported by the CFC Consulting PR team, singer Ruslana wins Eurovision 2004 in Turkey, allowing Ukraine to host Eurovision 2005 in Kyiv. 2005 — CFC Consulting becomes the official PR Partner of the Eurovision Song Contest 2005 in Kyiv. Along with media relations, the company carries out a series of projects to raise awareness about Ukraine among Eurovision fans across the globe. 2005 — Together with the PBN Company and Mark Studio, CFC Consulting participated in a Foreign Ministry tender to improve Ukraine’s image abroad. Due to backroom machinations and violations, the tender was awarded to an unknown company from Kharkiv, without even a website or project portfolio. CFC Consulting sued the Ministry in a case that became known internationally. 2006 — CFC signs a contract with Telenor to provide PR support in an ongoing corporate dispute between Telenor and Altimo (Alfa Group) over Ukraine’s biggest mobile operator, Kyivstar. Despite unethical PR practices, dirty tricks and paid publications by the other side, CFC Consulting’s PR support for Telenor was recognized as the most professional PR campaign of 2007 in an expert poll conducted by Profi, a weekly magazine. 2008 — CFC Consulting becomes the exclusive representative of CNN International in Ukraine and Belarus. 2010 — CFC Consulting develops the first-ever brand strategy and brand book for Ukraine, commissioned by the Ministry of Foreign Affairs. 2012 — CFC Consulting and CNN International jointly run a series of promotional campaigns aimed at raising awareness of Ukraine internationally, ahead of the finals of the European Football Championship, which took place in Ukraine and Poland over June-July 2012. 2014 — CFC co-founds the Ukraine Crisis Media Center (UCMC), an NGO and press center aimed at publicizing Ukraine’s positions and countering anti-Ukrainian propaganda in the international media. The initiative came about right after Russia’s occupation of Crimea and its launch of a military conflict in the Donbas in Eastern Ukraine. 2017 — For the second time, CFC Consulting becomes the official PR Partner of the Eurovision Song Contest held in Kyiv, after Crimean-Ukrainian singer Jamala won the Eurovision Song Contest 2016. 2018 — CFC Consulting becomes the PR Partner and general contractor for the first-ever Ukraine House at Davos, organized on the sidelines of the world’s biggest economic conference. To add value to companies, brands, organizations, individuals, and countries by helping them perform and communicate their best. To add value to companies and societies by implementing game-changing ideas worldwide. We comply with all national and international ethical standards for media relations and professional consulting. We do not do political consulting and we do not advise individuals or organizations whose actions and reputation do not match our vision and mission. We do not engage in corruption or bribery of any kind. We believe that good, transparent communication is the key to building a positive, honest image — whether it’s an individual, a company, an organization or a government. We believe that everyday value-based hard work with proper professional communication underlie highly valued brands. In December 2018, following the request of the Ministry of Information Policy of Ukraine the CFC company placed commercials on CNN International about the largest cities — Kyiv, Lviv, and Dnipro, the UkraineNOW brand, and Ukrainian traditions. 580 videos lasting 30 seconds were viewed by more than 200 million global audience. In addition, a banner campaign on the channel`s website had been showed another 500 thousand times. This information campaign duly represented Ukraine in the world and positioned it as a country of majestic cities with a thousand-year history and a great future, which offers great opportunities for travel and vacations. The cooperation history of CFC and CNN International TV channel has started more than 10 years ago. In 2008, CFC became the exclusive representative of international media in Ukraine and Belarus. Since then, six joint promo campaigns about Ukraine have been launched — the “All about U” campaign is among them. The concept of that campaign was used by the BBC channel for similar videos “Ukraine — All About U”. The project was held in November, 2018 on the eve of G20 summit in Argentina. 100whys.org web page with 100 rhetorical questions starting with the word “Why?” is available in English, Spanish and Ukrainian. Each question helps people understand the aggressive gist of Russian policy. There are also available stories of children who witnessed the war in eastern Ukraine. The press conference, organized by the Ministry of Information Policy and the CFC Big Ideas, was held before the summit on November 29 and caused resonance among Ukrainian and foreign media. Over 100 references to the project in the world press positively contributed to Ukraine’s informational presence in the global agenda. 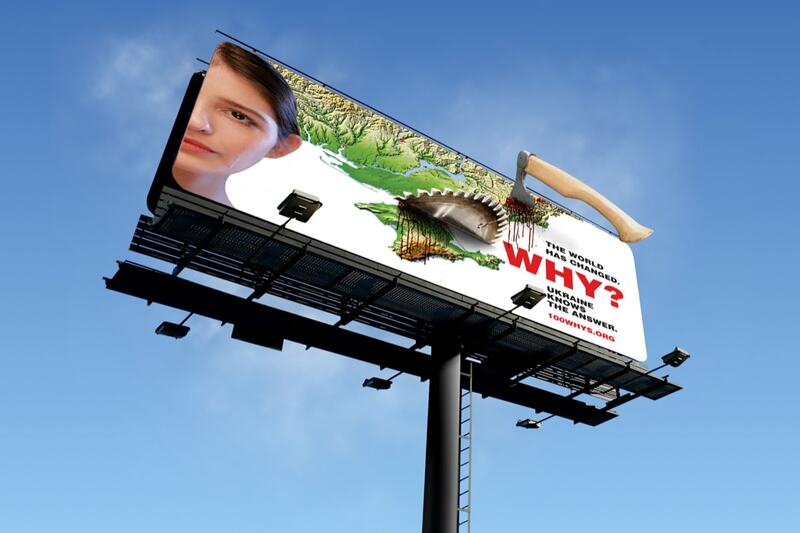 3D billboard visualizing the key idea of the campaign was demonstrated during the event The billboard had the image of Ukraine and huge circular saw and ax that stick out from it and trying to take away Crimea and parts of Donetsk and Luhansk regions. This project drew global attention to our country and gave the opportunity to tell the truth about Russian aggression against Ukraine and beyond. On May 25, 2018, on the eve of the UEFA Champions League final, leading Ukrainian designers presented haute couture collections on the “UEFA Fashion Picnic”. The designers of Ukrainian Fashion Week, Poustovit, Golets, NNAMUZA, FROLOV, AMG, Kir-Khartley and others among them, have developed 50 evening looks in the colors of the emblems of the tournament finalists — Real Madrid and Liverpool. The organization of the event was supported by the Kyiv City State Administration, the team of Ukrainian Fashion Week and CFC Consulting. On top of Ukrainian fashion creativity, the guests of the capital were treated to Ukrainian traditional cuisine in a modern interpretation, so-called “Ukrainian Fusion”. The highlight of this event was the premiere of the unofficial anthem of the UEFA Champions League Final 2018, which was performed by the young and talented singer Nastya Baginskaya. Vasyl Myroshnychenko, the CFC Consulting partner and the head of Ukrainian office of Ukrainian British City Club spoke up at the presentation of the analytical note “Audit of Ukrainian Foreign Policy: Ukraine — Great Britain”. The presentation was held at the Ukrainian Crisis Media Centre. The note was written by Institute of World Policy. Vasyl Myroshnychenko reminded that the commodity turnover between the countries is about 2 billion dollars nowadays, but potentially it could be larger, as well as British investments in Ukraine, which are also about 2 billion dollars. In particular, it is desirable to stimulate the export of goods with added value. He also agreed, we should begin to work on a mechanism of replacing the free trade zone, which will end by the UK’s full exit from the EU. “I think that the Ukrainian government should begin to raise this issue for discussion with the British government. It is currently not relevant to Britain, because now they are concerned on how to structure Brexit, but I do not see the unpredictable circumstances which may stop FTA validity when Britain exits from the EU”, — Vasyl Myroshnychenko said. Gennady Kurochka, Managing Partner of CFC Consulting and co-founder of the Ukrainian Crisis Media Center, received a bronze lion at the Cannes Lions International Festival of Creativity for the Ukrainian Crisis Media Center project “Ukraine Witness” in the category Lions Entertainment. Ukraine won the award at the Cannes Lions Advertising Festival for the first time in 26 years. “This is a breakthrough for the Ukrainian advertising and public relations community. We have finally broken the vicious circle that for many years did not allow us to rise above the shortlist,” said Gennadiy Kurochka. Gennady Kurochka, Managing Partner of CFC Consulting and the curator of the Second Floor Art Center gallery, presented the campaign “My Flag Goes Where I Go” in which the children painted the walls of the second floor of the Presidential Administration of Ukraine with patriotic drawings. The International Children’s Painting Competition “My Flag Goes Where I Go” gathered 86 children from Ukrainian communities in 22 countries around the world. The gallery contains children’s drawings devoted to Ukraine and the establishment of peace in our country. Children who created the space of this exhibition are migrants, children of ATO soldiers, students of art schools of Kyiv and Kyiv region. Gennady Kurochka said: “We offered to contact various countries where our Ukrainian communities are located, to get drawings of these children and in 2,5 years we finally selected these works”. Gennady Kurochka, the CFC Consulting managing partner and the Ukrainian Crisis Media Center co-founder, presented the campaign “Three Nations — One Freedom!”, which aims to unite the people of Canada, the Netherlands and Ukraine around their common heroic past and bright future. It is dedicated to the memory of Canadian soldiers with Ukrainian origin, who liberated the Netherlands from German occupation during the Second World War. Its main character is Wally D. Bunka, a Canadian of Ukrainian origin, who fought in the ranks of the Canadian Army in the spring of 1945. The campaign is dedicated to the next anniversary of the end of the Second World War in Europe and the upcoming voting in the Senate of the Netherlands. On the www.threenations-onefreedom.org you can read about Canadians of Ukrainian origin, who died in the Netherlands, and about Wally D. Bunka in particular as well. CFC Consulting became the official information partner of the Eurovision Song Contest-2017. During nearly two months, a team of more than 50 strategic communications professionals has worked to achieve one goal: to show Europe and the world the best of Ukraine and Ukrainians. For Eurovision-2017, the CFC held a successful PR campaign through which the “Arche of Diversity” project was embodied in reality — decorating the Arch of Peoples Friendship in the colors of rainbow. CFC also created such projects as the Art-plane at the Zhulyany airport, the banner at the trade unions’ house “Freedom is our religion”, the banner “Boxing and chess — our national sports!” at the Boryspil airport, the exhibition “Figures of Ukraine” at Zhulyany airport, #FeelSafe exhibition, the official Eurovision video of 2017 — “Celebrate Diversity”, the motto “Freedom of diversity” in Kyiv and the video project “Three characteristics of Eurovision 2017”. As a result of the joint efforts of Google Ukraine, StratCom UCMC and CFC Consulting, Verkhovna Rada of Ukraine became accessible for all users around the world. Through a virtual 3D-tour in a Google Street View mode, for the first time in history a top-level political institution became available online. Now anyone can stroll through the main hall of the Verkhovna Rada, where Ukrainian deputies meet; see a deputy’s workplace; look at the room from the podium, as if you are delivering an important speech; all this using computer or mobile device. Our team helps to predict, shape and, where necessary, mitigate the effects of regulatory policies through effective engagement with key government stakeholders and influencers by designing and executing integrated multi-stakeholder communication strategies and public affairs campaigns. We protect our clients’ enterprise value and corporate reputation during special issues and crisis situations by helping prepare and respond to crises through timely, compelling and confident engagement strategies. Armed with an in-depth understanding of global trends and an exceptional knowledge of local issues, our network in America, Europe and Arabian Gulf countries allows us to help our clients reach international audiences and raise their global profiles. We deliver integrated communication solutions that drive business growth. We know how to turn your business objectives into winning engagement strategies, your stakeholders into your loyal brand ambassadors, and your challenges into opportunities for growth. We help companies in different sectors grow, find new clients and investors, increase sales and revenues, and make their products more popular. When we work with businesses, we give them the ideas, energy and passion to reach a breakthrough. Our team helps organizations promote a cause, influence policy, increase sales, and manage reputation by providing innovative solutions for audience engagement and full-cycle event management. In 2002, CFC’s first Big Idea was to get Ukraine involved in the Eurovision Song Contest. After presenting the idea to the Foreign Ministry, CFC was engaged to negotiate between the National TV Company and the European Broadcasting Union on Ukraine’s membership, which was approved in late 2002. In 2004, CFC organized a Europe-wide PR campaign for Ruslana, who brought about Ukraine’s first victory at the Eurovision Song Contest. In 2005, CFC became the official PR Partner of the Eurovision Song Contest in Kyiv. Over 2007–2011, CFC organized PR support for a number of Ukrainian and non-Ukrainian artists at ESC, including Ani Lorak (2008), Alyosha (2010), and Mika Newton (2011) who represented Ukraine at the Eurovision Song Contest in Belgrade, Oslo and Dusseldorf, as well as Sofo (Georgia, 2007), who performed in Helsinki. Following Jamala’s victory in 2016, CFC was also able to contribute to the second Eurovision in Kyiv. In 2017, our company once again became the official PR Partner of the ESC. The PR campaign and activities were reinforced by a number of ancillary projects aimed at drawing more international attention to Ukraine and its culture. LeeMas Jewelry Design Studio is a prominent example of rebranding by CFC. Previously known under the trademark Hararuk, rebranding helped the company enter the Arab Gulf market. CFC facilitated a vibrant communication campaign for LeeMas and brought the owner to the UAE. Our efforts to drive LeeMas business growth helped the company establish cooperation with the biggest regional jewelry retail chain and other key players in the UAE and Saudi Arabia. CFC is now developing new creative ideas to deliver a customized message to foreign audiences and guests coming to Ukraine. In 2018 CFC, together with the City of Kyiv and Ukrainian Fashion Week, brought football and fashion together for a haute couture UEFA Fashion Picnic during the first-ever UEFA Champions League Final 2018 held in Ukraine’s capital. A total of 50 styles in colors that matched football club colors. Fans who came to Zhuliany and Boryspil Airports were pleasantly surprised by a warm “Shocking Welcome” organized with the support of the State Border Service: the officers’ faces were painted in the colors of the teams that got into the final. In 2005, CFC was a pioneer to promote investment in Ukraine by organizing a conference called “Ukraine’s Business Potential: Europe’s Emerging Tiger” in cooperation with PricewaterhouseCoopers. After the EU’s biggest expansion, Ukraine became an immediate neighbor of the Union, which opened up prospects for new investment. Organized in the European financial capital of Frankfurt-am-Main, the conference was a major step in facilitating European investments in Ukraine by bringing together European and Ukrainian business circles, as well as German and Ukrainian officials. UN Hundred is a unique CFC project under the auspices of the Ukraine Crisis Media Center. The project takes its name from a UNGA resolution on the territorial Integrity of Ukraine, which was voted in favor of by 100 members of the General Assembly. Interactive brochures with intriguing and insightful information served to make Ukraine more visible and more heard by the leaders of the states who attended the UN General Assembly. With their personalized video messages, the brochures were handed personally to each of the leaders right after they delivered their speeches. Four topics were highlighted in the UN Hundred project, each September for four years: the Euromaidan (2014), Crimea (2015), Ukrainian Inventions (2016), and Investments in Ukraine (2017). The first project, done in 2014, received the prestigious international Golden SABRE Award for Public Affairs in 2015. A memorial campaign devoted to the 75th anniversary of the Babyn Yar tragedy, this project was a mixture of commemorative experience, artistic revelations and unforgettable atmosphere — and a joint award-winning project of the Ukraine Crisis Media Center and CFC. The Witness campaign received the Bronze Lion award in Entertainment Lions in Music category at the Cannes Lions International Advertising Festival, marking Ukraine’s breakthrough in the contest for the first time in its history. Over 2006–2008, CFC Consulting advised Norwegian telecoms operator Telenor on public affairs in Ukraine in relation to a conflict around the Kyivstar operator. This was the biggest corporate conflict in the CIS in a decade. CFC developed a proactive communications strategy that effectively neutralized a negative PR campaign in the domestic press, built alliances with key decision-makers, arranged numerous high-profile meetings for Telenor’s executives with a large circle of stakeholders, and gained support in the business community. CFC’s campaign was named the most effective crisis-management communications strategy of 2007 in an independent expert poll by Profile weekly magazine. In 2010, CFC developed Ukraine’s first-ever national branding strategy for the Ministry of Foreign Affairs. We conducted research on perceptions of Ukraine abroad and produced a concept for Ukraine image campaigns on leading international TV channels, partnering with CNN International and the iVOX agency. The new branding strategy for Ukraine included 4 awareness campaigns and 11 projects. A pan-Ukrainian Facebook platform was launched to discuss the National Branding Strategy. Since 2008 CFC and CNN produced six joint global campaigns promoting Ukraine. Commercial videos were developed and produced by the CNN team, along with special vignettes and fact files about Ukraine that aired in Europe, the Middle East, North Africa, Asia, and the US. The “All about U” (2010–2011) and “Ukraine NOW” (December 2018) are the two biggest campaigns each viewed by more than 240 million people worldwide. The concept of the CFC-CNN “All about U” ad campaign was also run by BBC TV with a similar series of “Ukraine — All About U” video commercials. In 1993–1997, during his university years, Gennadiy headed the Students’ Council of the Institute of International Relations of Kyiv National Taras Shevchenko University. Once the President of the Club of Five Continents, it was Gennadiy who transformed an NGO into one of the leading companies on the Ukrainian market of strategic communications. Gennadiy takes a leading role in the development of the company’s business strategy. He is also directly involved in projects on strategic communications, lobbying, GR and PR, investor relations and internal corporate communications. Gennadiy graduated from the Taras Shevchenko Kyiv National University with a Masters in Law and holds a Masters Degree in International Relations from the Institute of International Relations, Kyiv, Ukraine. Vasyl has been with CFC Consulting since its inception in 2001. Vasyl is in charge of strategy and business development. He advises local and international clients on corporate communications, investor relations, financial communications and public affairs. Vasyl is a Director and Head of the Ukrainian office of the Ukrainian-British City Club, an organization promoting UK-Ukraine trade and investment relations. Vasyl holds MSc in international political economy from the London School of Economics and Political Science (UK) and MA and BA degrees in international relations from Institute of International Relations, Kyiv National Taras Shevchenko University (Ukraine). He is a graduate of the Global Village for Future Leaders of Business and Industry program at Iacocca Institute, Lehigh University (USA) and Swedish Institute Management Program (Sweden). Vasyl was the co-founder of the European Youth Parliament-Ukraine — an international youth non-governmental organization — where he served as a President in 2001–2004. Prior to that, he successfully completed internships in the House of Commons at the Canadian Parliament in Ottawa and Public Affairs Section of the US Embassy in Kyiv. Kostyantyn joined the CFC Consulting Company in 2003. His primary responsibilities within the company include operational management, financial management, as well as strategy development and the supervision of projects in key areas of the company’s portfolio. Kostyantyn is also actively involved in the spheres of strategic communications, corporate positioning and reputation management. As a fluent speaker of Arabic language Kostyantyn is in charge of the projects that require close cooperation with the countries of the Arab Gulf and Middle East. Kostyantyn is a graduate of the Global Village for Future Leaders of Business and Industry program at Iacocca Institute, Lehigh University (USA). He also holds B. A. and M. A. degrees in International Economic Relations from the Institute of International Relations of Taras Shevchenko Kyiv National University (Ukraine). Kostyantyn was a grant recipient of the exchange program in Cairo University, Egypt. Yuriy is part of the strategic advisory team consulting clients on the complex issues which require a substantial legal background such as corporate wars and conflicts. His area of expertise includes financial communications. Also Yuriy is the main idea generator in CFC projects on image, branding campaigns and corporate identity development. Yuriy was a lecturer in international public law at University of Wolverhampton (UK). Also, he worked for one of the leading think-tanks in Ukraine as well as interned with the office of the MP at the Ukrainian Parliament. Yuriy holds PhD in Legal Studies from University of Wolverhampton, UK, and Certificate in International Law from University of Oxford, UK, and MA and BA degrees in International Law from Institute of International Relations, Kyiv National Taras Shevchenko University. Oleksiy joined CFC team in November, 2003. He specializes in special issues, crisis communications and reputation management. Prior to joining CFC Consulting Oleksiy Syvak served as a Senior Consultant at the National Security and Defense Council of Ukraine. He also has an experience of working for the Ministry of Foreign Affairs as a Specialist of the Department of European International Organizations. Oleksiy is a graduate of the Naval Postgraduate School (USA), where he obtained his M. A. degree in International Security and Civil-Military Relations. He also holds M. A. and B. A. in International Relations from the Institute of International Relations of Taras Shevchenko Kyiv National University (Ukraine). Anna Lachykhina joined CFC Consulting in 2018 and specializes in strategic and crisis communication, and media and government relations. She is an experienced communications professional, having worked at Ukraine’s Ministry of Finance and the International Renaissance Foundation, one of the largest charitable foundations in Ukraine. Anna graduated with an MA in Political Science from the National University of Kyiv-Mohyla Academy and the Friedrich Schiller University in Jena, Germany, with a focus on international relations and international human rights law. Eva Berezovska joined CFC Consulting in 2015. Her core expertise is in government relations and event management. Prior to joining CFC, Eva worked as a project coordinator in robotics and automation. She also worked in sales at Daxx BV, a Dutch IT company, and successfully completed internships in Metro Cash & Carry and MediaCom. Eva is a graduate of the National University of Kyiv-Mohyla Academy, specializing in Marketing and Business Administration. Maksym Dzhyhun joined CFC Consulting in 2018. His main responsibilities are developing and implementing client communication strategies in social media. Maksym is a graduated in Political Science from Dragomanov National Pedagogical University. He is the author of a series of analytical articles on domestic politics, political image and political positioning. Maksym is also a political analyst for the Inpolit think-tank. He has participated in international student exchange programs in the US and Poland. Maria Dyrdenkova joined CFC Сonsulting in 2017. She specializes in political communication, civil society and government partnerships, public participation, and interest advocacy. Maria was previously involved in implementing e-governance and e-democracy projects such as the Open Government Partnership and E-governance for Accountability and Participation, working as a civil servant for almost 4 years. Maria graduated from the College of Europe, with a Master’s in European Interdisciplinary Studies specializing in governance in the EU. Kateryna Leliukh joined CFC Consulting in 2018. She specializes in media relations and social media management. Prior to joining CFC, Kateryna worked as journalist and editor in many top Ukrainian media, including TSN.ua, Novoe Vremya, and Hromadske TV. She has also been a project manager at AIESEC, the world’s largest youth organization, in Ukraine, and successfully completed an internship at Transparency International Ukraine. Kateryna holds BA in Political Science from Taras Shevchenko National University of Kyiv. Pavlo Leshchenko joined CFC Consulting in 2018. He specializes in government relations, economic analysis, media relations, event management, and corporate social responsibility (CSR) project management. Prior to joining CFC, Pavlo taught economics at the National University of Kyiv-Mohyla Academy as a part of his PhD work, in addition to organizing conferences and workshops, developing macroeconomic models, and writing academic articles. Pavlo graduated with an MA in Finance from the National University of Kyiv-Mohyla Academy and holds a certificate in Systems Dynamics from the University of Bergen, Norway. Oleksandra Nazola joined the CFC Consulting in 2018. She specializes in political analysis and has experience organizing state image projects and engaging with civil society organizations (CSOs). Oleksandra implemented projects for the UEFA Champions League Final in Kyiv, as well as joint projects with the Babyn Yar Memorial Center and the Ministry of Information Policy. Prior to joining CFC, Oleksandra worked in personal branding and PR strategy development at Polyteda Cloud, a Ukrainian tech start-up. Oleksiy Sabadan joined CFC Consulting in 2017. He specializes in strategic communications, social media management, event management and special project management. Oleksiy has experience in strategic communications for the security and defense sector, speechwriting and advising top Ukrainian officials. Oleksiy graduated from the Institute of International Relations at Taras Shevchenko National University of Kyiv, specializing in International Relations. Vitaliy Saltykov joined CFC Consulting in 2015. Vitaliy specializes in strategic and crisis communication, and in government relations. Prior to joining CFC, VItaliy worked at an IT start-up and AIESEC, the world’s largest youth organization, in Ukraine. Vitaliy has a Master’s in International Relations from Taras Shevchenko National University of Kyiv. Antin Shaposhnikov joined CFC Consulting in 2014. He specializes in political analysis and consulting, special project management, and crisis communication. Antin has experience in strategic communications for the security and defense sector, speechwriting and advising top Ukrainian officials. Antin obtained his Candidate of Science degree (equivalent to PhD in Ukraine) in Political Science. His dissertation paper is titled “Quasi-State as the Phenomenon of Modern Politics”. Antin graduated from Taras Shevchenko National University of Kyiv and Lomonosov State University of Moscow, with degrees in Political Science. Olha Shvets joined CFC Consulting in 2016. She specializes in public and media relations as well as projects involving country branding and strategic communications. Prior to joining CFC, Olha was actively involved in project management and coordination for a range of prominent NGOs in Ukraine. As a member of the European Youth Parliament, an international youth NGO, she successfully organized major events in Ukraine, Georgia and Ireland, with up to 350 participants, including Members of the European Parliament (MEPs) and President Martin Schulz. Olha holds MA and BA degrees in finance from the National Economic University in Kyiv. maintaining web-site(s) + promoting news stories through social social media. experience of studying or working in the country of your first foreign language.